Egypt cannot have a future as a viable, pluralistic democracy without the Muslim Brotherhood’s participation. In October 1992, Cairo was struck by a devastating earthquake, in which nearly 600 people were killed and several thousand injured. Within hours, members of the Muslim Brotherhood and other Islamist groups were out on the streets, clearing the rubble and providing food, blankets and tents to the thousands who had lost their homes. The government of then-President Hosni Mubarak, meanwhile, was nowhere to be seen. The quick response by the Brotherhood illustrated for many Egyptians how deeply rooted the Islamist movement had become, its members able to mobilize a vast social service network in Cairo’s poor neighborhoods while Mubarak’s secular, military-backed regime floundered after years of ineptitude and corruption. This episode is instructive when considering the long-term consequences of the popular uprising turned coup that overthrew Mohamed Morsi, Egypt’s first democratically elected president and the first Brotherhood leader to assume the presidency of an Arab country. The Egyptian military insisted that by deposing Morsi in early July, it was acting on the will of the Egyptian people, who had grown disenchanted with his clumsy rule and disastrous economic policies. But the army has gone much further: it arrested Morsi along with hundreds of other Brotherhood leaders and activists; it opened fire on Morsi’s supporters; it shut down media outlets sympathetic to the Islamists; and it is threatening to ban the Brotherhood entirely, as Mubarak had done. Many of Egypt’s secular and liberal activists have stood by, and some—blinded by their fear of the Islamists—are actively encouraging the military’s crackdown. Morsi’s overthrow has dangerous implications far beyond Egypt: it could reshape Islamist politics throughout the region. The Brotherhood is the oldest and most influential Islamist movement, inspiring branches and affiliates, in the Arab and Muslim worlds. In fits and starts over several decades, Islamist parties across the Middle East renounced violence and committed to participating in electoral politics. But now Islamists could view the Egyptian military’s coup as a signal that election results will not be respected and that secular forces, which have often fared poorly at the ballot box, will undermine Islamists before they’ve had a chance to rule. Ultimately, Islamists may conclude that the only way to achieve power is through violence. There are precedents: in 1992, the Islamic Salvation Front was on the verge of winning parliamentary elections in Algeria when the army intervened and canceled the results. That coup set off an eight-year civil war that killed at least 100,000 people. After a long history of repression, Brotherhood activists are sometimes obsessed with a narrative of martyrdom, one that revolves around the movement’s many leaders who were imprisoned, tortured and executed by the Egyptian state. Founded in 1928, the Brotherhood was initially focused not on politics but on religious outreach through preaching and providing social services. The group soon became politically active in the struggle against British colonial rule, and it called on Egyptians to confront the forces of imperialism and Zionism through a renewed commitment to Islamic piety. Gamal Abdel Nasser and his Free Officers Movement, which overthrew the British-backed monarchy in 1952, were nominally allied with the Brotherhood while keeping the Islamists at arm’s length. But after a member of the group tried to assassinate Nasser in 1954, the new military regime moved to crush them. Nasser arrested thousands of Brotherhood members; those who were not executed or forced into exile were interned in desert camps. The repression of the Brotherhood under Nasser in the 1950s and ’60s helped lay the ideological foundations for the subsequent emergence of violent Islamist movements. The most militant thinker of that period was Sayyid Qutb, a Brotherhood ideologue swept up in Nasser’s crackdown. After enduring nine years of prison and torture, Qutb published a manifesto in 1964, Milestones Along the Road, in which he argued that the secular Arab nationalism of Nasser had led to authoritarianism and a new period of jahiliyya, a term that has particular resonance for Islamists because it refers to the pre-Islamic “dark ages.” Qutb declared that a new Muslim vanguard was needed to restore Islam to its role as “the leader of mankind” and that a Muslim ruler who does not apply Islamic law—in its most austere iterations—should be removed from power. Nasser’s regime executed Qutb in 1966, and he joined the pantheon of Islamist martyrs. Most of the Brotherhood’s surviving leadership renounced violence in the 1960s, urging accommodation with the secular regime. But Qutb’s ideas flourished, and his disciples abandoned the Brotherhood and splintered into violent factions. The two most important were the Islamic Group and Islamic Jihad. In 1981, members of Islamic Jihad infiltrated the Egyptian army and assassinated President Anwar Sadat. Mubarak, who succeeded Sadat as president, launched a new crackdown on violent Islamists as well as the Brotherhood. In the 1980s, another wave of Islamists were forced into exile, and many ended up joining the CIA-backed jihad against the Soviet occupation of Afghanistan. The Egyptians—many of them followers of Qutb, including Ayman al-Zawahiri (a leader of Islamic Jihad at the time of Sadat’s assassination)—would later form the backbone of Al Qaeda. In the 1990s, the Islamic Group launched attacks on police, government officials, tourists and intellectuals throughout Egypt, killing some 1,200 and paralyzing the economy. 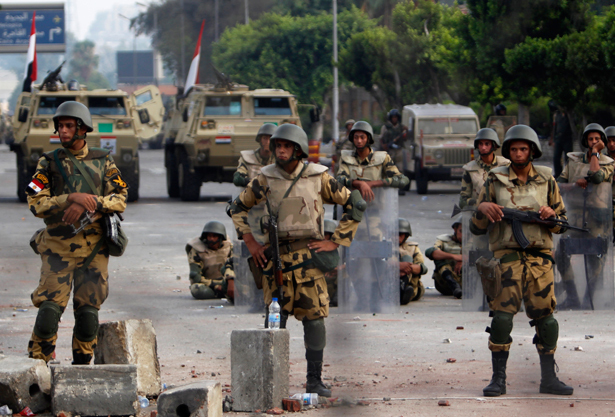 Mubarak’s regime responded with a severe crackdown, arresting, executing or deporting thousands of suspected Islamists. Egyptians rejected the violent Islamists, and during this period the Brotherhood, which adhered to nonviolence, began running candidates in elections for professional syndicates and later for seats in Parliament. For Egyptian Islamists—and indeed Islamists throughout the region—there are two paths after Morsi’s ouster: the jihadism advocated by Qutb and his disciples, or the peaceful choice made by Islamist parties in Turkey, Morocco, Tunisia, Egypt and elsewhere. These groups committed themselves to the slow work of building a social base, providing services to their constituents and participating in electoral politics. Let us hope the Muslim Brotherhood does not abandon that hard-fought path after this devastating setback—and that the Egyptian military ends its newest cycle of repression. Bob Dreyfuss looks at the strife within Al Jazeera after its Qatari management issued a directive to its journalists to support Morsi and the Muslim Brotherhood. Mohamad BazziTwitterMohamad Bazzi, a journalism professor at New York University, is a former Middle East bureau chief at Newsday. He is writing a book on the proxy wars between Saudi Arabia and Iran.